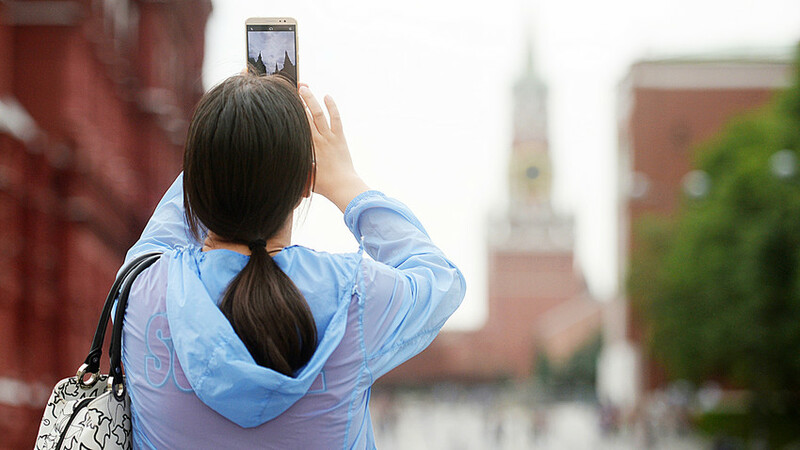 A tourist takes pictures of Kremlin in Moscow. Calling home from Russia with your domestic SIM card could make you bankrupt! If you study or work in Russia - or at least visit fairly often - a local SIM card is a good idea. There are four big telecommunication companies in Russia that provide mobile services. MTS (Mobile TeleSystems) and Megafon are the most popular, with about 80 million customers each. Beeline provides services to around 60 customers while Tele 2 has over 40 million clients (some people use several numbers). These companies have network coverage across Russia, so you won’t have problems when traveling to other regions. Moreover, they not only offer 3G and 4G cellular network technologies but also LTE. In some regions, there are local companies which provide telecommunication services. Companies suggest a wide range of tariffs, mostly through monthly plans and include free access to messengers and social media - what’s more, they are becoming cheaper and cheaper. For example, Tele 2 - the youngest operator - suggests 200 minutes, 50 SMS, 2GB of Internet, and unlimited surfing on social media for only 199 rubles ($3.5) a month. This company also has a per minute tariff without a subscription fee. Beeline offers 300 minutes and 1GB of internet for 350 rubles ($6) a month, and promises to double your Internet allowance if you pay the entire monthly sum in one go. Megafon’s cheapest tariff costs 400 rubles ($7) a month and includes 2GB of Internet and unlimited chatting on WhatsApp and Viber. The cheapest tariff from MTS costs 500 rubles ($8.5) a month and includes 7GB of Internet traffic, 200 SMS, free calling to MTS users across Russia, unlimited chatting on any messenger, and social media surfing. And of course, in Russia you only pay for sending SMS and making calls. More good news – starting in 2018, authorities promise to cancel roaming fees inside Russia’s different regions, so you will spend less money on calls and mobile Internet during a trip. You can choose your own number (as long as no one else has it) and order a SIM card on the operator’s website. You can then have it delivered or pick up the card at the company’s offices. Companies suggest a wide range of tariffs, mostly through monthly plans. Another way is to buy a SIM card at any branch or a shop that sells mobile phones. The seller may advise a tariff more suitable to your needs. In Russia, you can only buy a SIM card if you have your passport. In some shops, they may even ask to see your registration in Russia. Do you need to buy a phone in Russia? Russian cell phones work on the GSM, UMTS and LTE communication standards. If your phone supports such standards, you can use it with a Russian SIM card. If your phone uses only CDMA standard, you need to buy a new one in Russia (and there are no slots for SIM cards in such phones). Fortunately, they are not expensive. Moreover, here you can find the cheapest iPhones in Europe!